Proper lawn watering techniques are absolutely essential to an Ecology Friendly lawn. Good technique can result in water savings and help you reduce disease, insect, and weed infestations. Lawn watering techniques should be adjusted during the growing season to compensate for precipitation and lengthy hot and dry periods. The amount of water and the duration of each watering period should be adjusted according to soil types and grass types. Raising your cutting height will also help to retain moisture. Here are our top recommendations to help you water your lawn like a pro. Avoid watering in the afternoon because a large percentage of the water is lost to evaporation. You should also avoid evening watering because the lawn will remain wet for 12 to 15 hours, until the following morning sun dries off the lawn. This prolonged wet period can increase fungal disease incidence. It’s important to know that you can overwater your lawn. By allowing the surface (1 inch of soil) to dry out, any disease fungi will die back, and any newly germinated weed seeds will die off. This also encourages the grass plants to grow roots deeper into the soil, making your lawn more drought tolerant. By allowing the surface of the lawn to dry out between waterings, insect eggs like those of the Leather Jacket (European cranefly larvae) will die off. Prior to dormancy (browning), foot printing (foot prints and lawnmower tracks do not bounce back) and premature wilt (the lawn takes on a smoky greyish blue colour) can occur. If you notice either of these symptoms, this is a sign that your lawn needs water immediately in order to avoid drought dormancy (long term browning). Set your mower blade up an extra setting from where you normally cut at. The higher cut creates a thicker canopy of leaves that shade the soil and protect the grass plants growing points. By cutting higher during heat and drought stress you will see a remarkable improvement in your lawns health. Every home has different water pressure, pipe size, and sprinkler types, so you need to measure your system in order to determine the amount of time required to apply the necessary water. Place a flat bottomed, straight sided cup, like a coffee cup, under the water sprinkler and measure the time it takes to collect 1 inch (2.5 cm) of water in the bottom of the cup. You can use this time to determine how long your sprinkler needs to run to apply the necessary amount of water. 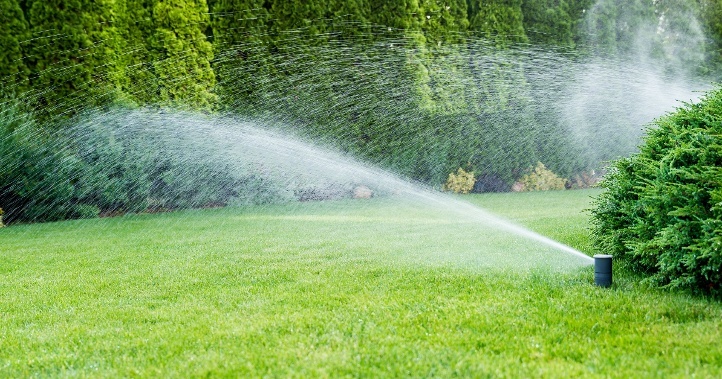 If you have lawn area on a slope, it is important to use a low volume water sprinkler in order to allow the water time to be absorbed by the lawn. If the water is applied too quickly much of the water will not be absorbed by the lawn and will run off down the slope. Soil aeration greatly enhances water penetration on slopes and is recommended as an annual service in these areas. Trees take up an enormous amount of water every day, pulling the soil moisture away from the surface via an extensive network of fibrous roots. Because of this, the surrounding grass is often the first to show signs of drought stress. It’s important to remember that when watering grass around large trees that you need to increase the frequency of watering in order to prevent the grass from turning brown. 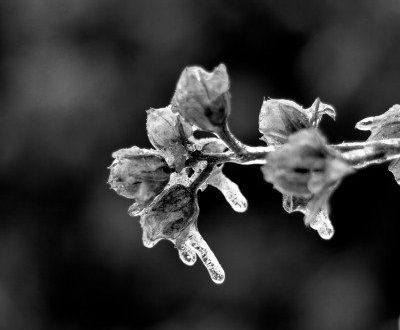 If there is a watering ban in your area, you will have to allow your lawn to enter a dormant state. The lawn turns brown when it goes into dormancy, but the crowns or growing points of the lawn will remain alive for at least 4 to 6 weeks without water. To keep your lawn alive during this drought dormancy, we recommend applying only 1/8 inch of water each month. Apply this water in the early morning in order to allow plenty of time for the lawn to absorb it before the morning sun. This tiny amount of water will help keep the lawn alive, but it will not stimulate the lawn to break dormancy. You want to avoid watering heavily and breaking the dormancy, and then letting the lawn dry out again, forcing it back into dormancy as this can stress the lawn and result in turfgrass death.